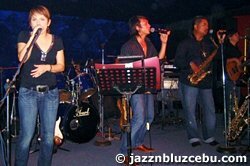 There are plenty of Cebu nightlife bars and live music to enjoy while taking in the nightlife in Cebu. If you prefer house and trance music, then you might want to take a look at the "Vudu" club at Crossroads where you'll be able to also find a lot of other entertainment facilities. The Crossroads complex on Banilad Road also houses some smaller more intimate Cebu nightlife bars such as "Cafe Teatro" which also has a DJ on most nights playing faves from the 70's, 80's and some Latin beats. Teatro is run by an attractive Cebuana appropriately named Queenie, who is a wonderful host. Further down the (Banilad) road you will find "Cielo," which after dinner, transforms into a cool club with a DJ who plays mainly house and some lighter techno music. You can also head over to I.T.Park where you'll find "Loft," offering up house music, trance, and lively techno beats. The name says it all, if you are looking for a more sophisticated ambiance with world-class music, look no further than "Jazz 'n Bluz." This slick restaurant bar not far from Ayala Mall usually has two bands performing and doesn't close until the last customer leaves. Despite the name, you will find Jazz, a little Blues and a lot of easy-listening music. Try "Slabadu" on AS Fortuna Street in Mandaue. They are kiddie free and operate on a basis of quality. They have been in operation for many years. The city has some fun Cebu nightlife bars with a lot of clubs that will keep your heart and brain pumping all night long!